Biography*: Ermengarde of Anjou (c. 1018 – 1076), daughter of Count Fulk III of Anjou and Hildegarde. [S746] Wikipedia, online http://Wikipedia.com, http://en.wikipedia.org/wiki/Ermengarde_of_Anjou,_Duchess_of_Burgundy. Biography*: Eachuinn Mór Maclean (1497–1568) or Hector Mor Maclean, or Hector Maclean the Great, was the 12th Chief of Maclean. Mór or Mor translates as great when added to a name in Scottish Gaelic. Lachlan Cattanach Maclean, 11th Chief was succeeded as chieftain and Lord of Duart by his son Eachann, better known as Hector Mor Maclean, or Hector the Great, in 1527. He is described by the seanachaidhs as being good, kind, affectionate, and brave, an accomplished politician and an approved warrior; and that in him the clan realized all it desired in a noble chieftain. To most of his vassals he granted extended leases, by way of encouragement in the improvement of lands and the building of more comfortable dwellings. He lived altogether, while permitted to do so by his troublesome neighbors with which he was surrounded, more like a noble of modern times than a feudal baron. He made many improvements on the demesne of Duart; and was the founder of that noble addition to Duart Castle called the Great Tower. His alliance was courted by many of the powerful lords; and the king thought it of importance to secure his loyalty by calling him into his council. Hence, we find him taking his seat in parliament as one of the lords of the kingdom. In private life his character was above reproach, and in his warlike pursuits he acted upon that system which had legal sanction. Julian Maclean, married first to Calvagh O'Donnell of Tirconnell, and secondly to Shane O'Neill, Prince of Ulster. She died in 1585. Janet Maclean, to MacDonald of Keppoch. Biography*: Lachlan Catanach Maclean (circa 1465 – 10 November 1523) was the 11th Clan Chief of Clan MacLean from 1515 until his murder in 1523. "Like several of his contemporaries he is a larger-than-life figure about whom several traditional stories, unusually unflattering caricatures, survive." It is possible that Maclean was a legitimate son of Lachlan Maclean, 10th Clan Chief, or an illegitimate son of Hector Odhar Maclean. On the assumption that he was the son of Hector, he may have received the appellation Catanach from his mother's people, Clan Chattan, with whom he was fostered. However the word catanach not only means "one of the Clan Chattan," but also hairy, rough, shaggy; hence he was called Lachlan the Shaggy. Maclean was clan chieftain of the Macleans of Duart and clan chief of the Macleans at a time when the Scottish Kings were asserting their kingship over the Scottish Isles. In 1493 John of Islay, Earl of Ross forfeited his title and was to die in prison. So the Macleans who had risen to prominence as stewards of the Lords of the Isles and had been given lands in Mull, Morvern, Tiree, Islay, Jura, and Lochaber, now owed their position directly to James IV of Scotland. Maclean had royal support to become clan chief as is shown by the royal charter he received in 1496. However he resisted the efforts of James IV of Scotland to bring the Scottish Isles more firmly under his control. By the end of 1503 Maclean was in open revolt and after attacking and devastating Badenoch, and supporting Donald Dubh MacDonald, an illegitimate grandson of John of Islay, claim to be Lord of the Isles. For these acts James IV of Scotland declared him a traitor and sent a fleet to the isles which captured Maclean's castle of Cairn-na-Burgh on the islet of Cairn na Burgh Mòr in the Treshnish Isles west of Mull. James gave the castle to Colin Campbell, 1st Earl of Argyll. After this defeat Maclean recognised the authority of the King and the charge of treason was dropped. The death of Lachlan Maclean at the Battle of Flodden on 9 September 1513 placed Lachlan Catanach as chief of the Maclean clan. In 1515 Maclean again rebelled, and the rebellion was also suppressed, after which he became a follower of the Earl of Argyll, a policy that his successors followed up until the start of the Wars of the Three Kingdoms. Maclean is said to have had at least six wives or mistresses. To cement his alliance, with the Argylls he married Katherine Campbell, daughter of Archibald Campbell, 2nd Earl of Argyll. Although politically convenient, the marriage was not a success, as she tried to poison him and he arranged to have her drowned by placing her on a rock in the sound of Mull. She was rescued just before the high tide drowned her. Ailean Maclean, second son of Lachlan Catanach, but better known as Ailean nan Sop, or Allan o' the Wisp, because he set fire to buildings with straw, was a very noted character. Many legends have been told concerning him, some of which can not be true, although they may contain a grain of truth. [S746] Wikipedia, online http://Wikipedia.com, http://en.wikipedia.org/wiki/Lachlan_Cattanach_Maclean,_11th_Chief. Biography*: He succeeded to the title of 2nd Seigneur d'Aubigny, in Berry [France, 1423] on 12 February 1428/29, although this is not certain, as he was not present in France until 1435, and was not described in 1437 as Seigneur d'Aubigny. He lived at Darnley, Scotland. Sir Alan Stewart of Darnley, ( after 1406-k. 1439) was a Scottish nobleman involved in the Hundred Years War. The son of John Stewart of Darnley and Elizabeth, daughter of Donnchadh, Earl of Lennox, Darnley accompanied his father and brothers to fight in France. Following his father's death at the Battle of the Herrings in 1429 during the Siege of Orléans, Darnley inherited his father's titles of the Lordships of Aubigny and Concressault, but not his County of Évreux. He also inherited the title of Constable of the Scottish Army in France, and the chieftaincy of the Stewarts of Darnley. However by 1437, he had resigned his French territories to his younger brother, Sir John Stewart and returned to Scotland. He became involved in a blood feud with the Boyd Family of Dean Castle. Darnley was killed in 1439 by Sir Thomas Boyd of Kilmarnock, his death was later avenged by his youngest brother Alexander Stewart. Biography*: He was invested as a Knight before 1387. He lived at Darnley, Scotland. In October 1419 he entered the service of France. He held the office of Constable of the Army of Scotland. He fought in the Battle of Baugé on 22 March 1420/21, where he distinguished himself. He was created 1st Seigneur de Concressault, in Berry [France] on 23 April 1421. He was created 1st Seigneur d'Aubigny, in Berry [France] on 26 March 1423. He was created Comte d'Evreux, in Normandy [France] in January 1426/27. He fought in the Battle of the Herrings on 12 February 1428/29. Sir John Stewart of Darnley, 1st Lord of Concressault and 1st Lord of Aubigny, Count of Évreux (c. 1380-d.1429) was a Scottish nobleman and prominent soldier during the Hundred Years War. The son of Sir Alexander Stewart of Darnley, he was a distant cousin of the Stewart Kings of Scotland, being descended from the second son of Alexander Stewart, 4th High Steward of Scotland, Sir John Stewart of Bonkyll. Darnley inherited his father's estates in 1404, and was knighted c.1418. In 1419, Darnley was part of the Scottish expeditionary force which under the Earls of Buchan (Darnley's cousin) and Wigtown, set out to France. By 1420 Darnley was referred to as Constable of the Scottish Army there. Darnley was present at the major Scots victory at the Battle of Baugé in 1421, and for his part in the fight was the granted the lordships of Concressault in 1421, and Aubigny-sur-Nère in 1422, by a grateful Dauphin. Darnley was present, and a commander, at the defeat at Cravant, where he was captured and suffered the loss of an eye. During his captivity, Darnley could not participate at the Battle of Verneuil, at which the Franco-Scottish army was heavily defeated. His ransom having been paid by the Dauphin Charles, Darnley once again entered French service, taking command of the remaining Scots forces in the country. Following a victory over the English at Mont Saint-Michel, Darnley was made Count of Évreux, and allowed to append the Fleur-de-Lis to his coat of arms. In 1427, he along with Renaud of Chartres, the Archbishop of Rheims, returned to Scotland to raise further troops, and to negotiate the future marriage between Princess Margaret of Scotland, and the Dauphin's son Louis. He returned again to France in 1429, where he took part in the Siege of Orléans where he arrived with 1000 men. Four days later, he commanded the Scottish contingent at the Battle of the Herrings, where he was killed. John Stewart of Darnley was buried in the Sainte-Croix Cathedral, Orléans. Sir Alan Stewart of Darnley, from whom descend the Stewart Earls of Lennox, and all Monarchs of Scotland, England and Great Britain from James VI of Scotland onwards. Sir John Stewart, 2nd Lord of Aubigny, from whom descend all later Dukes of Aubigny and Dukes of Lennox. Biography*: Sir Alexander Stewart of Darnley (d. 1404) was a Scottish nobleman. John Stewart of Darnley, Lord of Aubigny and Concressault, Count of Évreux (k. 12 February 1429) killed at the Battle of the Herrings. Sir William Stewart of Garlies (k.c.14 September 1402) killed in captivity by Sir Henry Percy following the Battle of Humbleton Hill. Ancestor to the present day senior branch of non "Royal" Stewarts, the Earls of Galloway. Biography*: Sir William Keith of Galston (d.1336) was a Scottish Knight who fought in the Wars of Scottish Independence. Keith was the son of Robert de Keith, and grandson of John de Keith King's Marischal. Keith was in command of troops under Sir James Douglas at the Capture of Berwick in 1318. Upon the death of Robert I of Scotland in 1329 he accompanied Sir James Douglas on crusade in Spain, with the King's embalmed heart. He was one of the few survivors of Douglas's party of knights and men-at-arms who survived the Battle of Teba. He was responsible for returning the King's heart and Douglas' bones and heart to Scotland, where the King's heart was buried at Melrose, and Douglas's remains solemnly interred in the kirk of St Bride in Douglas. He was in command at Berwick again in 1333 when the disastrous English victory at Halidon Hill took place. In 1335 Keith was an ambassador to England, and in 1336 he was fighting at the Siege of Stirling Castle, where he was killed. [S816] M.A., D.D., F.S.A James Taylor, The Great Historic Families of Scotland, The Keiths. Biography*: Sir Alexander Stewart of Darnley (d.1374) was a Scottish nobleman. Alexander Stewart was the third son of Sir Alan Stewart of Dreghorn. By 1345 he had received a charter for lands at Cambusnethan from Robert II. Following the successive deaths of his elder brothers, he inherited their baronies of Cruikston and Darnley, and is referred to as Dominus of the two properties by 1371. Biography*: He was granted the lands of Dreghorn, Ayr for his services to Robert the Bruce. He purchased the lands of Crookston in 1330. He fought in the Battle of Halidon Hill on 19 July 1333. The son of John Stewart of Bonkyll and his wife Margaret de Bonkyll, Sir Alan fought for Robert the Bruce during the First War of Scottish Independence. Sir Alan accompanied Edward Bruce to Ireland in 1315, during the latter's attempt at the throne of Ireland. He was captured by the English in 1316 but was quickly ransomed. For his services to the King, Sir Alan was granted the lands of Dreghorn in Ayrshire. Sir Alan Stewart was killed with his brothers, Sir James and Sir John Stewart, at the Battle of Halidon Hill in 1333. Biography*: As a result of his marriage, Robert Stewart, 1st Duke of Albany was styled as Earl of Menteith on 28 February 1361. He was created 1st Earl of Fife [Scotland] on 30 March 1371. He resigned as Earl of Fife on 6 March 1372. He held the office of Great Chamberlain [Scotland] between 1383 and 1407.2 In 1385 he made a successful raid into England. In 1388 he made another successful raid into England. He held the office of Guardian of the Realm [Scotland] between 1 December 1388 and 27 January 1399. He succeeded to the title of 2nd Earl of Buchan [S., 1382] on 24 July 1394. He was created 1st Duke of Albany [Scotland] on 28 April 1398. He was created 1st Earl of Atholl [Scotland] on 2 September 1403, for the life of King Robert III only. He was deposed as Earl of Atholl on 4 April 1406. He held the office of Regent of Scotland in June 1406. He resigned as Earl of Buchan, in favour of his second son John, and a special remainder to his third and fourth sons, Andrew and Robert on 20 September 1406. In 1417 he again invaded England, but without success this time. Robert Stewart, Duke of Albany (c. 1340 – 3 September 1420), a member of the Scottish royal house, served as Regent (at least partially) to three different Scottish monarchs (Robert II, Robert III, and James I). He also held the titles of Earl of Menteith (28 February 1361), Earl of Fife (1361; resigned in 1372), Earl of Buchan (1394; resigned in 1406) and Earl of Atholl (1403, for the duration of Robert III's life only), in addition to his 1398 creation as Duke of Albany. A ruthless politician, Albany was widely regarded as having caused the murder of his nephew, the Duke of Rothesay, and brother to the future King James I of Scotland. James was held in captivity in England for eighteen years, during which time Albany served as Regent in Scotland, king in all but name. He died in 1420 and was succeeded by his son, Murdoch Stewart, Duke of Albany, who would be executed for treason when James returned to Scotland in 1425, causing the almost complete ruin of the Albany Stewarts. Robert Stewart was an illegitimate son of the future King Robert II of Scotland (1316–1390) and of Elizabeth Mure of Rowallan. He was legitimated in 1349 by his parents' marriage. Robert's grandfather was Walter Stewart, 6th High Steward of Scotland (1293–1326) and his father was the first monarch of the House of Stewart. His great-grandfather was Robert the Bruce (1274–1329), legendary victor of the Battle of Bannockburn. Robert Stewart was raised in a large family with many siblings. His older brother John Stewart (1337–1406) became Earl of Carrick in 1368, and would later be crowned King of Scotland under the name Robert III. In 1361 Stewart married Margaret Graham, Countess of Menteith (1334–1380), a wealthy divorcee who took Robert as her fourth husband. His sister-in-law's claim to the Earldoms of Menteith and Fife allowed him to assume those titles, becoming Earl of Menteith and Earl of Fife. In 1362 the couple had a son and heir, Murdoch Stewart, (1362–1425) who would in time inherit his father's titles and estates. Stewart was responsible for the construction of Doune Castle, which remains largely intact today. When Stewart was created Earl of Menteith, he was granted the lands on which Doune Castle now stands. Building may have started any time after this, and the castle was at least partially complete in 1381, when a charter was sealed here. Scottish politics in the late 14th century was unstable and bloody, and much of Albany's career would be spent acquiring territory, land and titles, often by violent means. In 1389 his son Murdoch Stewart was appointed Justiciar North of the Forth, and father and son would now work together to expand their family interest, bringing them into violent confrontation with other members of the nobility such as Donald McDonald, 2nd Lord of the Isles. During the reign of their infirm father as King Robert II (1371–1390), Robert Stewart and his older brother Lord Carrick functioned as Regents of Scotland, Kings in all but name, with Albany serving as High Chamberlain of Scotland. He also led several military expeditions and raids into the Kingdom of England. In 1389, the Earl of Carrick became incapacitated in an accident and, though he nevertheless acceded to the throne as King Robert III in 1390, this "sickness of the body" caused control of the kingdom eventually to devolve in 1399 to his son and heir apparent, David Stewart, Duke of Rothesay, who held the first dukedom created in the Scottish Peerage. Although In 1398 Robert was himself appointed Duke of Albany, bringing him still greater power and wealth, power had begun to shift away from Albany and towards his nephew. "This Robert, Duke of Albany, having obtained the entire government from his brother, King Robert, he caused the Duke of Rothesay to be murdered, thinking to bring the Crown into his own family". "to avoid the like fate, King Robert resolved to send his younger son James, to France, then about nine years old, who being sea-sick, and forced to land on the English coast...was detained a captive in England eighteen years. At these misfortunes King Robert died of grief in 1406." After the death of his brother King Robert III, Albany ruled Scotland as Regent, king in all but name. His young nephew, the future James I of Scotland, would remain in exile and imprisonment in England for 18 years. Perhaps unsurprisingly Albany made little effort to secure the young Prince's ransom and return to Scotland, focusing his energies instead on securing his own power and interest. Albany's political triumph did not settle his differences with the other members of the nobility, in particular Donald McDonald, 2nd Lord of the Isles, who in 1411 led an army of clansmen from the Northwest Highlands into open battle with the Stewarts. This conflict began when Albany had attempted to secure the Earldom of Ross for his second son John, despite McDonald's better claim. At the Battle of Harlaw (known as "Red Harlaw" on account of its savagery) on 24 July 1411, losses were heavy on both sides, though McDonald's eventual withdrawal allowed the Stewarts to claim a strategic victory. The Stewart army was led by Albany's nephew, Alexander Stewart, Earl of Mar, who would later sit on the jury of knights and peers which convicted Albany's son Murdoch Stewart, Duke of Albany and two of his sons of treason, virtually annihilating the Albany Stewarts. Murdoch Stewart, Duke of Albany (1362–1425) (Married Joan Douglas and later to Isabel, Countess of Lennox). he Duke of Albany died in 1420 in Stirling Castle and lies buried in Dunfermline Abbey in Fife. He was succeeded as Duke of Albany and Regent of Scotland by his son, Murdoch Stewart, Duke of Albany. But Murdoch would not enjoy his power for long. In 1425 the exiled King James, captive in England for 18 years, finally returned to Scotland, and executed Murdoch and most of his family for treason, causing the almost complete ruin of the Albany Stewarts. Murdoch Stewart's sole surviving male heir was his youngest son, James the Fat, who fled to Ireland after a brief rebellion against the King over the arrest of his father and brothers. James remained in Ireland, unable to return, and died there in 1429. He was never able to inherit his father's titles, since they had been declared forfeit. [S746] Wikipedia, online http://Wikipedia.com, http://en.wikipedia.org/wiki/Robert_Stewart,_Duke_of_Albany. Biography*: Arnulf of Carinthia (850 – 8 December 899) was the Carolingian King of East Francia from 887, the disputed King of Italy from 894 and the disputed Holy Roman Emperor from 22 February 896 until his death. Arnulf was, according to most sources the illegitimate son of Carloman, King of Bavaria, and his concubine Liutswind, perhaps of Carantanian origin, and possibly the sister of Ernst, Count of the Bavarian Nordgau Margraviate in the area of the Upper Palatinate, or perhaps the burgrave of Passau, as some sources say. After Arnulf's birth, Carloman married, before 861, a daughter of that same Count Ernst, who died after 8 August 879. As it is mainly West-Franconian historiography that speaks of Arnulf's illegitimacy, it is quite feasible that the two females are one and the same person and that Carloman later on actually married Liutswind, thus legitimizing his son. Arnulf was granted the Duchy of Carinthia, a Frankish vassal state and successor of the ancient Principality of Carantania, by his father Carloman, after Carloman had become reconciled with his own father Louis the German and was created King of Bavaria. Arnulf spent his childhood on the Mosaburch or Mosapurc, which is widely believed to be Moosburg in Carinthia, only a few miles away from one of the Imperial residences, the Carolingian Kaiserpfalz at Karnburg, which before as Krnski grad had been the residence of the Carantanian princes. Arnulf kept his seat here and from later events it may be inferred that the Carantanians, from an early time, treated him as their own Duke. Later, after he had been crowned King of East Francia, Arnulf turned his old territory of Carinthia into the March of Carinthia, a part of the Duchy of Bavaria. After Carloman was incapacitated by a stroke in 879, Louis the Younger inherited Bavaria, Charles the Fat was given the Kingdom of Italy and Arnulf was confirmed in Carinthia by an agreement with Carloman. Bavaria, however, was ruled more or less by Arnulf. Arnulf had in fact ruled Bavaria during the summer and autumn of 879 while his father arranged his succession and he himself was granted "Pannonia," in the words of the Annales Fuldenses, or "Carantanum," in the words of Regino of Prüm. The division of the realm was confirmed in 880 on Carloman’s death. When, in 882, Engelschalk II rebelled against the Margrave of Pannonia, Aribo, and ignited the so-called Wilhelminer War, Arnulf supported him and even accepted his and his brother's homage. This ruined Arnulf's relationship with his uncle the Emperor and put him at war with Svatopluk of Moravia. Pannonia was invaded, but Arnulf refused to give up the young Wilhelminers. Arnulf did not make peace with Svatopluk until late 885, by which time the Moravian was a man of the emperor. Some scholars see this war as destroying Arnulf's hopes at succeeding Charles. Arnulf took the leading role in the deposition of his uncle, the Emperor Charles the Fat. With the support of the nobles, Arnulf held a Diet at Tribur and deposed Charles in November 887, under threat of military action. Charles peacefully went into his involuntary retirement, but not without first chastising his nephew for his treachery and asking only for a few royal villas in Swabia, which Arnulf mercifully granted him, on which to live out his final months. Arnulf, having distinguished himself in the war against the Slavs was elected by the nobles of the realm (only the eastern realm, though Charles had ruled the whole of the Frankish lands) and assumed his title of King of East Francia. Arnulf took advantage of the problems in West Francia upon the death of Charles The Fat to secure the territory of Lorraine, which he converted into a kingdom for his son, Zwentibold In addition, in 889, Arnulf supported the claim of Louis the Blind to the kingdom of Provence, after receiving a personal appeal from Louis’ mother, Ermengard, who came to see Arnulf at Forchheim in May 889. Recognising the superiority of Arnulf’s position, in 888 Odo of France formally admitted the suzerainty of Arnulf. In 893, Arnulf switched his support from Odo to Charles the Simple after being persuaded by Fulk (Archbishop of Reims) that it was in his best interests. Arnulf then took advantage of the fighting that followed between Odo and Charles in 894, taking territory from West Francia and transferring it to his dominion. At one point, Charles was forced to flee to Arnulf and ask for his protection. His intervention forced Pope Formosus to get involved, as he was worried that a divided and war weary West Francia would be easy prey for the Normans. In 895, Arnulf summoned both Charles and Odo to his presence at Worms. Charles’s advisers convinced him not to go, and he sent a representative in his place. Odo, on the other hand, personally attended, together with a large retinue, bearing many gifts for Arnulf. Angered by the non-appearance of Charles, he welcomed Odo at the Diet of Worms in May 895, and again supported Odo's claim to the West Francian throne. In this same assembly, he bestowed upon his illegitimate son Zwentibold, a crown as the King of Lotharingia. Arnulf was not a negotiator, but a fighter. In 890 he was successfully battling the Slavs in Pannonia. In 891, the Danes invaded Lotharingia, and crushed an East Frankish army at Maastricht. At the decisive Battle of Leuven in September 891, he defeated an invading force of the Northmen, or Vikings, essentially ending their invasions on that front. The Annales Fuldenses report that the bodies of dead Northmen blocked the run of the river. After his victory, Arnulf built a new castle on an island in the Dijle river (Dutch: Dijle, English and French: Dyle). As early as 880, Arnulf had designs on Great Moravia, and had the Frankish bishop Wiching of Nitra interfere with the missionary activities of Methodius, with the aim of preventing any potential for creating a unified Moravian nation. In 893 or 894, Great Moravia probably lost a part of its territory — present-day Western Hungary — to him. As a reward, Wiching became Arnulf’s chancellor in 892. Arnulf, however, failed to conquer the whole of Great Moravia when he attempted it in 892, 893, and 899. Yet Arnulf did achieve some successes, in particular in 895, when Bohemia broke away from Great Moravia and became his vassal. An accord was made between him and the Bohemian Duke Borivoj I (reigned 870-95); Bohemia was thus freed from the dangers of invasion. However, in his attempts to conquer Moravia, in 899 Arnulf invited across the Magyars who had settled in Pannonia, and with their help he imposed a measure of control on Moravia. While Arnulf remained alive, the Magyars refrained from any overt acts of pillage, but with Arnulf’s death, they proceeded to invade Italy in 900. Like all early Germanic rulers, he was heavily involved in ecclesiastical disputes; in 895, at the Diet of Tribur, he presided over a dispute between the Episcopal sees of Bremen, Hamburg and Cologne over jurisdictional authority, which saw Bremen and Hamburg remain a combined see, independent of the see of Cologne. 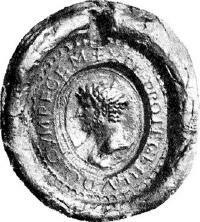 In Italy, the Iron Crown of Lombardy was being fought over between Guy III of Spoleto and Berengar of Friuli. Berengar had been crowned king in 887, but Guy was in his turn crowned in 889. While Pope Stephen V supported Guy, crowning him Roman Emperor in 891, Arnulf threw his support behind Berengar. In 893, a new pope, Formosus, not trusting the newly crowned co-emperors Guy and Lambert, sent an embassy to Omuntesberch, where Arnulf was holding a Diet with Svatopluk, to request Arnulf come and liberate Italy, where he would be crowned in Rome. Arnulf met the Primores of the Kingdom of Italy, dismissed them with gifts and promised to enter Italy. Arnulf sent his son Zwentibold with a Bavarian army to join Berengar of Friuli. They defeated Guy, but were bought off and left in autumn. Arnulf then personally led an army across the Alps early in 894. In January 894 Bergamo fell, and Count Ambrose, Guy’s representative in the city, was hung from a tree by the city’s gate. Conquering all of the territory north of the Po, he forced the surrender of Milan and then drove Guy out of Pavia, where he was crowned King of Italy, but went no further before Guy died suddenly in late autumn, and fever incapacitated his troops. His march northward through the Alps was interrupted by Rudolph, King of Transjurane Burgundy, and it was only with great difficulty that Arnulf crossed the mountain range. In retaliation, Arnulf ordered his illegitimate son Zwentibold to ravage Burgundy. In the meantime, Lambert and his mother Ageltrude travelled to Rome to receive papal confirmation of his imperial succession, but Formosus, still desiring to crown Arnulf, was imprisoned in Castel Sant'Angelo. In September 895, a new embassy arrived in Regensburg beseeching Arnulf's aid. In October, Arnulf undertook his second campaign into Italy. He crossed the Alps quickly and took Pavia, but then he continued slowly, garnering support among the nobility of Tuscany. First Maginulf, Count of Milan, and then Walfred, Count of Pavia, joined him. Eventually even the Margrave Adalbert II abandoned Lambert. Finding Rome locked against him and held by Ageltrude, he had to take the city by force on 21 February 896, freeing the pope. Arnulf was greeted at the Ponte Milvio by the Roman Senate who escorted him into the Leonine City, where he was received by Pope Formosus on the steps of the Santi Apostoli. On 22 February 896, Formosus led the king into the church, anointed and crowned him, and saluted him as Augustus. Arnulf then proceeded to the Basilica of Saint Paul Outside the Walls, where he received the homage of the Roman people, who swore “never to hand over the city to Lambert or his mother Ageltrude”. Arnulf then proceeded to exile to Bavaria two leading senators, Constantine and Stephen, who had helped Ageltrude seize the city. Leaving one of his vassals, Farold, to hold Rome, Arnulf marched on Spoleto, where Ageltrude had fled to join Lambert. On his way down, Arnulf suffered a stroke, forcing him to call off his campaign and return to Bavaria. Arnulf only retained power in Italy as long as he was personally there On his way north, he stopped at Pavia where he crowned his illegitimate son Ratold, sub-King of Italy, after which he left Ratold in Milan in an attempt to preserve his hold on Italy. That same year, Formosus died, leaving Lambert once again in power, and both he and Berengar killed any officials who had been put in place by Arnulf, as Ratold also fled from Milan to Bavaria. Rumours of the time made Arnulf's condition to be a result of poisoning at the hand of Ageltrude. On his return to Germany, he exercised very little further control in Italy for the rest of his life, although his agents in Rome did not prevent the accession of Pope Stephen VI in 896. Although he eventually became a supporter of the claims of Lambert, he initially gave his support to Arnulf. With his return to Germany in 896, Arnulf found that his physical ill health meant he was unable to deal with the problems besetting his reign. Italy was lost, raiders from Moravia and Hungary were continually raiding his lands, and Lotharingia was in revolt against Zwentibold. He was also plagued by escalating violence and power struggles between the lower German nobility. On Arnulf's death in 899, he was succeeded as a king of the East Franks by his son by his wife Ota (died 903), Louis the Child. Arnulf had the nobility also recognize the rights of his illegitimate sons Zwentibold and Ratold as his successors. Zwentibold, whom he had made King of Lotharingia in 895, continued to rule there until the next year. Biography*: Louis (also Ludwig or Lewis) the German (806 – 28 August 876), also known as Louis II, was a grandson of Charlemagne and the third son of the succeeding Frankish Emperor Louis the Pious and his first wife, Ermengarde of Hesbaye. He received the appellation 'Germanicus' shortly after his death in recognition of the fact that the bulk of his territory had been in the former Germania. Louis II was made the King of Bavaria from 817 following the Emperor Charlemagne's practice of bestowing a local kingdom on a family member who then served as one of his lieutenants and the local governor. When his father, Louis I (called the pious), partitioned the empire toward the end of his reign in 843, he was made King of East Francia, a region that spanned the Elbe drainage basin from Jutland southeasterly through the Thuringerwald into modern Bavaria from the Treaty of Verdun in 843 until his death. His early years were partly spent at the court of his grandfather, Charlemagne, whose special affection he is said to have won. When the emperor Louis divided his dominions between his sons in 817, Louis received Bavaria and the neighbouring lands but did not undertake the governing of such until 825, when he became involved in wars with the Wends and Sorbs on his eastern frontier. In 827, he married Emma of Altdorf, sister of his stepmother Judith of Bavaria, and daughter of Welf, whose possessions ranged from Alsace to Bavaria. Louis soon began to interfere in the quarrels arising from Judith's efforts to secure a kingdom for her own son Charles (later known as Charles the Bald) and the consequent struggles of his brothers with their father. His involvement in the first civil war of his father's reign was limited, but in the second, his elder brothers, Lothair, then King of Italy, and Pepin, King of Aquitaine, induced him to invade Alamannia — which their father had given to their half-brother Charles — by promising to give him the land in the new partition they would make. In 832, he led an army of Slavs into Alamannia and completely subjugated it. Louis the Pious disinherited him, but to no effect; the emperor was captured by his own rebellious sons and deposed. Upon his swift reinstatement, however, the Emperor Louis made peace with his son Louis and restored Bavaria (never actually lost) to him (836). In the third civil war (began 839) of his father's ruinous final decade, Louis was the instigator. A strip of his land having been given to the young Charles, Louis invaded Alamannia again. His father was not so sluggish in responding to him this time, and soon the younger Louis was forced into the far southeastern corner of his realm, the March of Pannonia. Peace had been made by force of arms. When the elder Louis died in 840, and Lothair claimed the whole Empire, Louis allied with the half-brother, Charles the Bald, and defeated Lothair and their nephew Pepin II of Aquitaine, son of Pepin, at the Battle of Fontenay in June 841. In June 842, the three brothers met on an island in the Saône to negotiate a peace, and each appointed forty representatives to arrange the boundaries of their respective kingdoms. This developed into the Treaty of Verdun, concluded in August 843, by which Louis received the bulk of the lands lying east of the Rhine (Eastern Francia), together with a district around Speyer, Worms, and Mainz, on the left bank of the river. His territories included Bavaria (where he made Regensburg the centre of his government), Thuringia, Franconia, and Saxony. He may truly be called the founder of the German kingdom, though his attempts to maintain the unity of the Empire proved futile. Having in 842 crushed the Stellinga rising in Saxony, in 844 he compelled the Obotrites to own his authority and put their prince, Gozzmovil, to death. Thachulf, Duke of Thuringia, then undertook campaigns against the Bohemians, Moravians, and other tribes, but was not very successful in freeing his shores from the ravages of the Vikings. In 852, he had sent his son Louis the Younger to Aquitaine, where the nobles had grown resentful of Charles the Bald's rule. The younger Louis did not set out until 854, but he returned the following year. In 853 and the following years, Louis made more than one attempt to secure the throne of Western Francia, which, according to the Annals of Fulda (Annales Fuldenses), the people of that country offered him in their disgust with the cruel misrule of Charles the Bald. Encouraged by his nephews Pepin II and Charles, King of Provence, Louis invaded in 858; Charles the Bald could not even raise an army to resist the invasion and fled to Burgundy; in that year, Louis issued a charter dated "the first year of the reign in West Francia." Treachery and desertion in his army, and the loyalty to Charles of the Aquitanian bishops, brought about the failure of the enterprise, which Louis renounced by a treaty signed at Coblenz on 7 June 860. In 855, the emperor Lothair died, and Louis and Charles for a time seem to have cooperated in plans to divide Lothair's possessions among themselves — the only impediments to this being Lothair's sons: Lothair II (who received Lotharingia), Louis II (who held the imperial title and the Iron Crown), and the aforementioned Charles. In 868, at Metz they agreed definitely to a partition of Lotharingia; but when Lothair II died in 869, Louis the German was lying seriously ill, and his armies were engaged with the Moravians. Charles the Bald accordingly seized the whole kingdom; but Louis the German, having recovered, compelled him by a threat of war to agree to the Treaty of Meerssen, which divided it between the claimants. The later years of Louis the German were troubled by risings on the part of his sons, the eldest of whom, Carloman, revolted in 861 and again two years later; an example that was followed by the second son Louis, who in a further rising was joined by his brother Charles. In 864, Louis was forced to grant Carloman the kingdom of Bavaria, which he himself had once held under his father. The next year (865), he divided the remainder of his lands: Saxony he gave to Louis the Younger (with Franconia and Thuringia) and Swabia (with Raetia) to Charles, called the Fat. A report that the emperor Louis II was dead led to peace between father and sons and attempts by Louis the German to gain the imperial crown for Carloman. These efforts were thwarted by Louis II, who was not in fact dead, and Louis' old adversary, Charles the Bald. Louis was preparing for war when he died on 28 August 876 at Frankfurt. He was buried at the abbey of Lorsch, leaving three sons and three daughters. His sons, unusually for the times, respected the division made a decade earlier and each contented himself with his own kingdom. Louis is considered by many to be the most competent of the grandsons of Charlemagne. He obtained for his kingdom a certain degree of security in face of the attacks of Norsemen, Magyars, Slavs, and others. He lived in close alliance with the Church, to which he was very generous, and entered eagerly into schemes for the conversion of his heathen neighbours. Louis, having established two of his other daughters as abbesses of convents, appointed Irmgard (also known as Ermengard) to govern first the monastery of Buchau and then the royal abbey of Chiemsee in Bavaria. She is commemorated as a saint on 16 July. Biography*: Eberhard (c. 815 – 16 December 866) was the Frankish Duke of Friuli from 846. His name is alternatively spelled Everard, Evrard, Erhard, Eberhard, or Eberard, or in Latinized fashion Everardus, Eberardus, or Eberhardus. He wrote his own name "Evvrardus". He was an important political, military, and cultural figure in the Carolingian Empire during his lifetime. He kept a large library, commissioned works of Latin literature from Lupus Servatus and Sedulius Scottus, and maintained a correspondence with the noted theologians and church leaders Gottschalk, Rabanus Maurus, and Hincmar. "Saint Evrard, Duke of Frioul and son-in-law of Louis le Débonaire, was one of the principal personages of the Carolingian period. As his name belongs to a great history, our region could, in right name, be re-vindicated as one of his glories. Cysoing, above all, has the right to call itself Saint Evrard's village. The past of Saint Evrard and of the village of Cysoing are themselves intimately tied such that it is impossible to separate them. One would excuse us for therefore reuniting them." So reads the preface of an ecclesiastic work on Evrard and Cysoing. There was a "flurry" of research and publishing associated with the discovery of Evrard's body at Cysoing early in the twentieth century—this "flurry" was mostly limited to Lille/Roubaix and within elements of the Church. He inherited the title of Duke of Friuli from his father Unruoch II. His mother was Engeltrude, daughter of Beage, Count of Paris. Evrard was from an illustrious Frankish family. His father was Unruoch II. "His father was Berengar, the son of Count Unroch." "After other authors, Unroch, the grandfather of Saint Evrard, should have been the Duke of Frioul." "Alas, some have written that Saint Evrard had for his father Carloman I, the brother of Charlemagne." "His grandfather was, it is said, the Count Unroch who was leaving the court of Charlemagne and signatory to the will of the emperor." His mother was Engeltron of Paris, a daughter of Begue, Count of Paris. "As for his mother, she was, Buzelin says, the daughter of Didier, king of the Lombards." Saint Evrard lived in the ninth century. He was born under the reign of Charlemagne and died under that of Charles the Bald. Saint Evrard was elevated to the court of Charlemagne and of Louis the Débonaire. He took his education at the Palace School founded by Charlemagne and organized by Alcuin, where he studied from the medieval programs known as the trivium and the quadrivium. There he got a taste of the letters and sciences, at the same time that he developed his famous piety. It is without doubt that it was at the Palace School that Saint Evrard began to build the rich library of which he enumerates the books with so much care in his will. As soon as his age permitted him to carry arms, Saint Evrard took part in numerous military expeditions. Named Duke of Frioul and Count or Marquis de Trévise, in Italy, he defended his country against invasion by the Bulgars and managed to completely drive these new barbarians from the peninsula—825-830. He rendered service unto Louis le Débonaire that was still more distinguished. During the tragic years (830-839) where the emperor had suffered at the hand of his son's revolt the most undignified treatment, Count Evrard remained inviolably loyal. He exercised his influence in Lothair's sphere (the elder son of the emperor) to bring about a reconciliation between father and son. It is certain that it was on his council in 839, that Lothaire went to Worms to implore the pardon of his father. In return for his services, the emperor Louis le Débonaire gave Count Evrard the highest honor possible: the hand of his (acknowledged) daughter, the Princess Gisèle, in marriage. The Princess Gisèle, a woman of piety and virtue, was the daughter of Louis le Débonaire and his second wife, the empress Judith. Among the rich domains the Princess brought with her in her dowry, Count Evrard found the fisc of Cysoing. One gives the name fisc, in this age, to large, rural properties separate from the royal domains; that is, to sorts of farms with a residence for the master and homes for settlers. The Royal Fisc of Cysoing, situated at the center of the country of Pèvele, was one of the most beautiful in the region. The stay seemed so agreeable to Saint Evrard and the Princess Gisèle that they made it one of their regular residences. The castle which they inhabited was without doubt the same as that of the lords of Cysoing in following centuries. It found itself part of a magnificent property, surrounded by water, that actually belongs to the family Bigo-Vanderhagen. The farming ditches were marked in the oldest documents. It is not rash to think these were dug in Saint Evrard's time, or perhaps even earlier. Already, in the century before (in 752), the little hamlet established on the royal fisc of Cysoing has been made famous through the martyrdom of Saint Arnoul. Saint Arnoul, a courageous warrior, who was, it is said, the father of Godefroid, Bishop of Cambrai-Arras, had been attached to the court of a noble lord, his relative. "His virtues and his merits were so radiant that God accorded his prayers more than one miracle during his life. He became even more glorious through his martyrdom." He was so devoted to his master that he eventually died for him thus attaining martyrdom. Saint Arnoul was already honored at Cysoing when Saint Evrard and Princess Gisèle went to take possession of their domain. His relics were conserved there. Cysoing, of this age, has therefore a church, or less a chapel that was without doubt the same chapel as the royal fisc. Saint Evrard, at Cysoing, had a chaplain named Walgaire. They (Evrard and Gisèle) decided to found a monastery at Cysoing. The project was long and difficult, and was not complete at the time of Evrard's or Gisèle's deaths. The monastery was initially made in honor of Saint Saveur and Mary (mother of Jesus). The religious lived there under canon law in a community with all the rigors of the cloister. Their special function was singing solemnly in the church. They maintained public prayer. Saint Evrard was known to enjoy singing with the choir. After his later campaigns in the defense of Italy, the remains of Pope Callixtus I were re-interred in the Abbey at Cysoing. Saint Evrard, himself, has organized his home in a way so perfectly that it was more like a monastery than a castle. He was seconded in this task by his pious wife, Gisèle, who dedicated herself to the education of their many children. The poor and ill were sure of finding not only banal security at Cysoing, but also help and protection. The social question of the time, that of serfs, also preoccupied Saint Evrard. He had freed a good number. In their testimony, he expressly refrained from impeding their liberty. He never forgot those who he didn't free, and tried to improve their lots. Though he was a courageous and formidable, he worked all his life for peace. His private virtues were no less remarkable. In his elevated position, he strove to preserve modesty and humility, to avoid splendor and arrogance. His zeal for the glory of God, to spread the Truth, to convert the infidels, was celebrated throughout the Church. Alas, his piety, his taste for ceremonies of worship, he devotion to the saints, his respect for the precious relics was apparent in his every act. Saint Evrard's activity was not limited to the royal fisc of Cysoing, as he involved himself freely with matters of other domains and the empire in general. Emperor Louis the Debonaire went to die (840) and the war, a cruel war without mercy, exploded between the Emperor Lothaire and his two brothers, Louis le Germanique and Charles the Bald. Saint Evrard strongly deplored this fighting/battling and fratricide and made all efforts to bring it to an end. After the bloody battle of Fontenay (25 June 841), he left the ambassadorial envoy of Lothaire near that of Lothaire's brothers for peace negotiations. The preparatory conference took place in 842 at Milin, near Châlons in Champagne. It was decided to divide the empire between the three brothers. The negotiators, among which Evrard could be found, were charged with making the partitioning equitable/fair. It was not before August 843 that they presented their report to the three kings at Verdun. The negotiations ended and peace was re-established between the three brothers, Saint Evrard left in haste for Italy. Italy was under threat from "African Saracens". These Saracens had been named as helpers, in 842, by the Duke of Benevento and they would soon become a threat to regimes throughout the peninsula. They menaced Rome and pillaged it many times. Saint Evrard, in his position as Duke of Friuli, was made a captain/leader of the resistance. The war wore on for several years and ended in 851 with the defeat of the Saracens. "Evrard has a reputation for being both a courageous soldier and able leader throughout these battles. In the tradition of Charlemagne, Evrard forced the vanquished to convert to Christianity, meritoriously teaching them the Gospel, himself." Sometime after this solemnity, Saint Evrard returned to Italy. We find him in 858 among the ambassadors who the emperor Louis le Jeune, son of Lothaire, sent to Ulm, near his uncle Louis le Germanique. After this date, we know nothing more about Saint Evrard until his Testimony, a very interesting/curious/strange document, whose authenticity is certain and in which we are given information on the life of Saint Evrard. This Testimony was made in Italy, at Musiestro Castle, in the county of Trévise, in 867. Evrard and his consort meticulously recorded not only their lands and possessions within a prepared will, but the identities and relationships of family members and neighboring royals. With the agreement of his spouse, Princess Gisèle, Saint Evrard portioned his goods among his seven children. The eldest, Unroch, got all properties in Lombardy and Germany. The second, Bèrenger, got Annappes with its depencencies less Gruson and the other properties in the Hesbaye and in the Condrost. The third, Adélard, got the lands of Cysoing, Camphin, Gruson and Somain, with charges and respects of all the properties of the Abbey in these regions. The fourth, Rodolphe, got Vitry-en-Artois and Mestucha, except for the church at Vitry which was given with the Abbey at Cysoing.